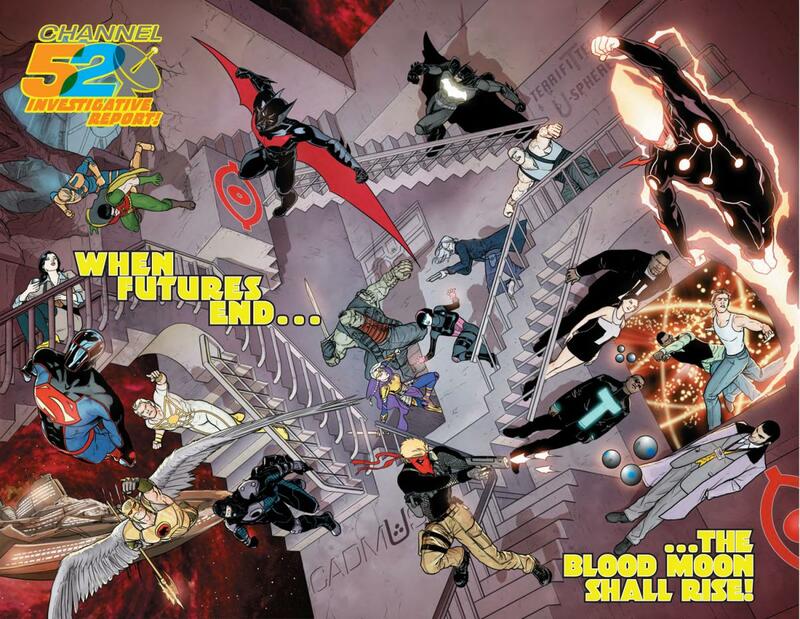 Last night during the "Blood Moon" lunar eclipse, DC Comics released a teaser poster for The New 52: Futures End, featuring a number of surprising images from around the DC Universe-to-be. "When Futures End, the blood moon rises," says the poster, which features 22 characters, including the long-missing Booster Gold, the criminally-underused Lois Lane and a number of heroes whose titles have been cancelled during the New 52, including Frankenstein, Agent of S.H.A.D.E., Grifter, Mr. Terrific and members of Stormwatch. Batman Beyond is also featured, alongside surprising takes on Robin (hey, wait, Robin's alive?) and Superman. Terrific and Firestorm get new looks. You can check out the image above. The New 52 - Futures End comes to stores on Free Comic Book Day with a #0 issue, and will proceed as a weekly series in June. You can click on the version below to see it in a larger size.